Definition of positron emission tomography (PET). 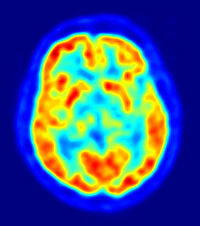 PET scan of the human brain. Image courtesy of Jens Maus. involves injecting a molecule into the blood that emits positrons, which can be detected by an external device. Because the molecule travels in the blood stream, detection of the positrons it emits allows for the imaging of blood flow in the brain in an approximation of real time, which thus provides an image of brain activity because brain regions that are active generally require more blood flow.